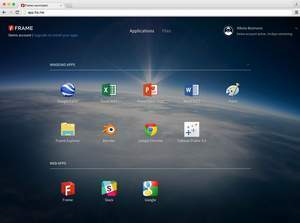 SAN MATEO, CA--(Marketwired - Jun 23, 2015) - Frame (fra.me), the cloud platform that lets users run any software in a browser, announced today that it has secured $10 million from Columbus Nova Technology Partners (CNTP), Bain Capital Ventures and SQN Venture Partners to support Frame's rapid growth. New funding will expand Frame's industry-changing technology and allow it to continue to grow its leadership, sales and engineering teams. Frame pioneered the delivery of rich graphics apps from the cloud directly into any browser with no plugins required. Its platform has been in use for more than a year by leading software vendors, including Adobe Systems and Siemens PLM. The company will use the funds to expand the service and make it possible for any enterprise, business, and individual to install and run their own Windows applications in the cloud. The public beta of Frame's new end-user service will go live on July 8 on five continents, with plans starting at under $10 per month. Frame also announced that CNTP Managing Director Mohsen Moazami has been named to the company's Board of Directors. "Frame's potential to change the landscape of end-user computing is immense," said Mr. Moazami. "Our investment will help the company continue to grow toward its goal of fundamentally transforming the way applications are managed and delivered from the cloud." "In 2012, we set out to change the way people think about personal computing," said Dr. Nikola Bozinovic, founder and CEO of Frame. "Today we are taking a significant step toward realizing that goal by letting anyone with an Internet connection access his own cloud computer. We are thrilled to have the strategic support from our investors to help us in our mission." To learn more about Frame visit fra.me. To speak with Frame founder and CEO Nikola Bozinovic regarding the future of personal cloud computing, contact press@fra.me. Founded in 2012, Frame is transforming personal computing by letting people and teams run their apps in the cloud and share them easily. Frame (previously Mainframe2) is headquartered in San Mateo, CA, with offices in Nis, Serbia, and is financed by Silicon Valley VCs including Columbus Nova Technology Partners and Bain Capital Ventures. Frame's stunning online launchpad lets users run any Windows software in a browser, no plugins required. Users can bring their own files from Dropbox, Google Drive or Box to free themselves from the desktop forever.